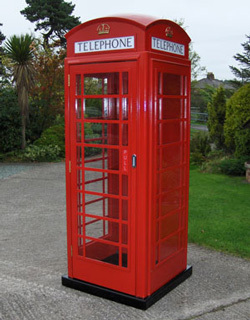 As well as being used as telephone boxes on UK streets, restored K2, K6 and K8 kiosks are used as telephone boxes around the world by businesses and collectors, who have installed them in homes, pubs, gardens, nightclubs, restaurants, hotels and offices. Many have been converted in imaginitive ways and have been given a new lease of life as pool huts, bars, fish tanks and much more. In John Timpson's book a Requiem for a Red Box, he quoted someone saying, "a natural for the bathroom or by the pool or both. You can have one painted to fit in with your colour scheme that will add value to your property. Red telephone boxes create a talking point for friends and visitors." Famous red telephone box owners include Elton John, Dudley Moore and Tom Jones. 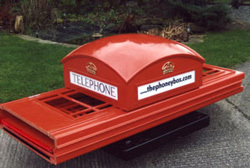 The Phoney Box is a faithful representation of the original K2, K6 or K8 design but far more practical, being light in weight and supplied pre-painted. Assembly is simple and requires no special tools or skills. Your Phoney Box can be supplied with the solid panel at the back, on the right or left hand side, and the door hinged on the right or left.